This is a picture of a “restroom thataway” sign in an airport. The sign shows three different ways of communicating the same message. My guess is this was a literal translation. Anyone read the local language text on that sign? Thus we have an opportunity to talk about Design Reviews. Whether it’s an email or a web app, get a set of eyes on that design of someone who can speak the language of your intended audience. 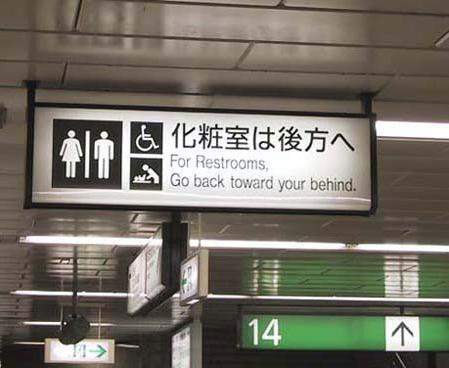 In the end, I suppose even bad translations can offer good advice, or for some, Just-in-Time-Training.